A delightful story of steadfast love between a pirate boy and his brave mom. After reading his favorite book about a pirate boy, Danny wonders what would happen if he sailed away on a pirate ship. Luckily, his mother reassures him that she would find him, even if she had to swim on a dolphin, battle sea monsters, and wield a bottle of pirate-shrinking magic spray to do it! Young readers will love this adventurous and ultimately reassuring tale of a mother's love. 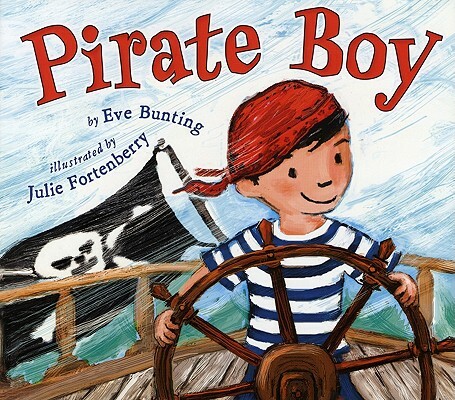 Eve Bunting, who has written many books for children, including Pirate Boy, was inspired to write Washday when she came across a set of washing instructions written long before the days of electric washers and dryers. She lives in California with her husband. Julie Fortenberry is an abstract painter and a children’s book illustrator. She has a Master’s Degree in Fine Arts from Hunter College. Her illustrations have appeared in Sadie’s Sukkah Breakfast (Kar-Ben) and Pippa at the Parade (Boyds Mills Press). She lives in Westchester County, New York.